The Recipe: Healthy finger food, a favorite for holiday gatherings. The trick is to roast the mushrooms first, before stuffing, a tip that works for all stuffed mushrooms. Here I've stuffed the mushrooms with a rich-tasting low-cal, low-carb and gluten-free mixture of cauliflower, the mushroom stems (no waste!) and a touch of smoked gouda cheese, just enough to bind it all together. For Weight Watchers, two mushrooms add up to just a single point! Not into mushrooms? I've got six more ideas for healthy finger foods! The Conversation: Defying the aisles of seasonal "foods" with healthy appetizers and healthy finger food. It's also the season where rich food tempts us at every turn. Already in September, the Sam's Club where I pick up prescriptions (and Greek yogurt, cottage cheese and rotisserie chicken, all household staples!) was four aisles deep in sugary, chocolatey food treats, not really "food" at all, just highly processed combinations of sugar, flour and fat, ingredients best consumed in great moderation. Except there they are, in a single Sam's Club, enough empty calories for who-knows-how-many for who-knows-how-long. Multiply that by 643 locations. Sigh. So this recipe is dedicated to those of us who pay attention to nutrition 52 weeks a year, even when we choose to revel in something completely delicious that's "ten points and worth every one!" We all know that portion size is one culprit. It's why these Stuffed Mushrooms are one-bite big. But the filling also uses cauliflower, that "chameleon" that turns cauliflower into Mashed "Potatoes", Hummus, "Potato" Salad and even "Rice". Here it substitutes for the bread crumbs that cooks use to stuff mushrooms. Even the mushroom stems give you the impression of cooked sausage! The trick here, the real trick to all stuffed mushrooms, is to roast the mushrooms before they're stuffed. Once they're cooked, you can stuff them with almost anything but the combination of cauliflower and smoked gouda was a real hit at my book club last month and I'll definitely be making these again! ALANNA's TIPS Mushrooms shrink so much! I use what I think of as "regular" or "medium" size mushrooms, they make tiny one-bite appetizers, easy finger food. My grocery also sells much larger mushrooms specifically for stuffing, these would work too but would likely take longer to roast and would use more filling. There's not much oil to stir with the mushroom caps. It's plenty for flavor and richness but the small amount does mean you really need to get in there with that spatula, stirring again and again to distribute the oil as best you can. Grated cauliflower? No, you can't "buy" that. :-) Just take a couple of big florets from a pretty head of cauliflower and run them across the largest holes of a cheese grater. You could also chop them very fine. I'm leery of a food processor, I have the idea it would create a cauliflower mush, some pieces way to small, others too big. Evenly small is best, a cheese grater works perfectly. After roasting the mushrooms, if there's liquid in the baking sheet, be sure to save all that flavor and spoon it into the filling. The filling is so good! You'll probably have plenty leftover. We found it great to have on hand for breakfast omelets, even just spread on a tortilla and warmed for a half a minute in the microwave for a quick lunch. So good! MUSHROOMS Heat oven to 450F/230C. Line a baking sheet with foil, give it a quick spritz with cooking spray. Brush any dirt off the mushrooms, then break off stems and reserve them for the filling. In a bowl, use a spatula to combine the mushroom caps, oil, garlic, salt and pepper. Arrange the mushrooms gill-side down (round-side up) on the baking sheet. Roast for 20 minutes. Flip the mushrooms over, roast for 10 more minutes, then let cool. The mushrooms will darken and shrink considerably, it's natural. FILLING While the mushrooms roast, heat the oil in a large, non-stick skillet. Add the onion, cauliflower, mushroom stems and garlic as they're prepped. Let cook, stirring often, until cauliflower is soft and fully cooked, about 20 minutes. Once it's cooked, stir in sherry and vinegar, stir until completely distributed. Stir in smoked gouda. Taste and adjust seasoning. Can be made ahead of time, just refrigerate and use within three or four days. Makes about 3 cups, enough for about 4-1/2 dozen mushrooms. STUFF THE MUSHROOMS With a small spoon, scoop filling into a mushroom in a mound. Top with a pumpkin seed. Repeat with remaining mushrooms, collect in an oven-safe serving. Can be stuffed up to a day ahead of time, just cover and refrigerate. BAKE Heat oven to 450F. Bake uncovered for about 15 minutes or until hot and bubbly. Best hot but also good at room temperature. MAKE-AHEAD & FREEZE? I have the idea that Stuffed Mushrooms could be stuffed and frozen, then, still frozen, popped into a hot oven some time later – in fact, I'd intended to test that idea. And then my book club ate all the mushrooms, not a single one was left! NUTRITION INFORMATION Per Stuffed Mushroom: 21 Calories; 2g Tot Fat; 1g Sat Fat; 3mg Cholesterol; 28mg Sodium; 1g Carb; 0g Fiber; 0g Sugar; 1g Protein. WEIGHT WATCHERS POINTS WW Old Points .5 & WW Points Plus .5 (yeah, that's two mushrooms for one point). 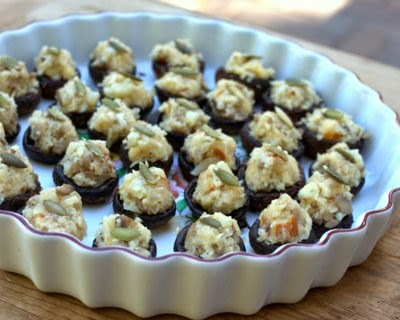 CALORIE COUNTERS 100-calorie serving = 5 stuffed mushrooms (5g protein). Roasting technique adapted from Cook's Illustrated.